Pura Tanah Lot is located on the southern coast of Bali that is in Beraban village, district of Kediri, Tabanan, or 15 km from downtown Denpasar. Pura Tanah Lot temple is one of "Dang Khayangan Temple" which in history is closely related to travel or "darmayatra" Dang Hyang Nirarta i on the island of Bali. According to legend, this temple was built by a Brahmin who wander from Java. He is Dang Hyang Nirartha a successful priest who had strengthen confidence and build 6 Hinduism Temples at the 16th century. At that time the ruler of Tanah Lot, Beraban, jealous of him because his followers began to leave and follow Nirartha. Beraban Nirartha ordered to leave the Tanah Lot. He agreed and before he left the Tanah Lot with its power to move boulders into the middle of the beach (not into the sea) and built temples there. He also change the shawl into a snake temple guards. Snake is still there today and scientifically snakes include species of sea snakes that have a characteristic flat tail like a fish, striped yellow and black color has a poison 3 times more powerful than cobra snake. End of the legend states that Bendesa Beraban 'finally' a follower Nirartha. It also can be seen in the ejection "Dwijendara tatwa" which tells of the journey Dang Hyang Dwijendra along the southern coast of Bali island, and arrived at a small island consisting of soil or soil paparangan hard. This is where eventually built parahyangan named Tanah Lot temple. 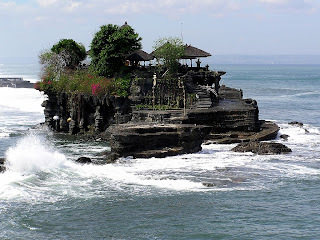 The main Pelinggih Meru temple Tanah Lot is an overlap of five which is the god Varuna stana or also known as Ida Dalem Segara Bhatara as ruler of the ocean. Piodalan ceremony at Pura Tanah Lot held on every Buda Wage Wuku Langkir once every 210 days, or within six months of calendar Bali. Aside from being a holy parahyangan, its natural panoramic beauty of the main attraction for tourists. Sightseeing lots of land located in the village Beraban Kediri Tabanan District, about 13 km west of Tabanan. North of Tanah Lot Temple there is a temple situated on a cliff that juts into the sea. This cliff temple with the land and shaped like a bridge (curved). Tanah Lot, famous as a beautiful place to watch the sunset, tourists usually crowded in the afternoon to see the beauty of the sunset here.